A long climb through the forested hills of the Vara valley, on some typical twisting roads, leads to a summit with great views, before it’s down all the way to the coast. However, a small sting in the tail nearLevanto awaits, which is rewarded with a final descent. Then reverse the route home again on the same. This being Italy, there are ample opportunities for refreshments along the way, then there’s time for ice cream when you arrive at the coast. 1. Leave Gotra on the SP523 towards Benonia, climbing steadily for 10 miles to 3200 feet, passing through Spallavera along the way. This excellent road, twists and turns in true european fashion, before the descent begins as you cross from Parma into Uguria, and the views open up across the hills. 2. The winding road then take you down at speed, with superb views all around. The twisting descent eventually evens out at Varese Ligure, continuing more steadily down, and passing through San Pietro Vara, where you take the road around to the left (SS566) signed towards Sesta Godano. Passing through Sesta Godano, continue along the SS566 until a small roundabout is reached, with a banked high wall to the right of the road. 3. 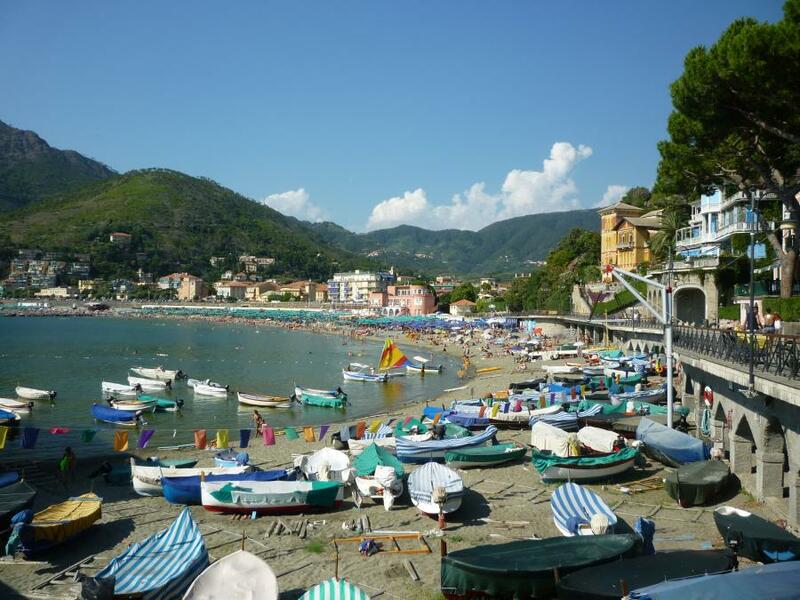 At the roundabout (the 30 miles), take the road right, signed towards Levanto, with a few more twisting bends, as you make your way under the main E80 motorway and down to the coast. The Ligurian coast comes into view as you make the final descent. Signs for Centro take you to the tree lined streets, leading you to the coast. Time for a real coffee and some pasta before heading back up the route for a return leg. This route is taken directly from a great website for cycling in the Florence area: http://www.florencebikepages.com/ Our thanks goes to them for such a great route. This route leads to face the climb of dell’Alberaccio Molin Plan, included in 1996 Giro d’Italia; it’s a fairly affordable climb up to Lubaco where it becomes more challenging. In the initial stretch of the route it is possible to continue the bike path along the Arno from to Girone, but only when the path is dry. A trip I will remember forever – A rollercoaster of emotions and landscapes. But let me start with the key figures. Lago del Narèt is a reservoir, which is the source of the river Maggia and is located in the northern Italian part of Switzerland (Canton of Ticino) in a height of 2311 m a.s.l. Our gpx starts the route in the small town of Giubiasco, north of Lugano, with ample facilities. 1. It was a sunny and warm day, no clouds were seen and the sky was stealth blue. Best conditions for a hard and long but also impressive day on the bike. Ticino is characterized by it’s souther climate, we were surrounded by palms and the typical smell and handled the first elevation gain through the beauty of Valle Maggia, until the road leads further away from the river and the traffic became less. 2. We crossed one beautiful and small mountain village after another and noticed, how the landscapes turned more and more from a southern climate to a deciduous forest. The real and hard climb starts nearly at kilometre 40 – Serpentine and steep sections characterised the beginning of suffering. 3. At kilometre 58, we crossed the Lago Sambuco, which marks the start of the last but hardest kilometres – The gradient was permanently between 9 and 20 %. Slowly the nature around us turns into a rugged landscape, I was fighting against the painful and screaming legs and slowly hoped, that this torture would be over soon! 4. Finally, the view made us forget all the pain. Deep blue water in a setting of snow covered mountains – No traffic, no tourists, just pure nature around us…There are many few places where you’ll find something like this and we found paradise on 2311m a.s.l. So the climb up to Lago del Narèt is a real insider tip for those, who are looking for quiet routes, breathtaking landscapes and who are not shying away from a long and hard climb J But where else you’ll have the chance to challenge a climb through nearly all climate zones, without traffic and on adventurous roads? It’s worth a trip for sure! 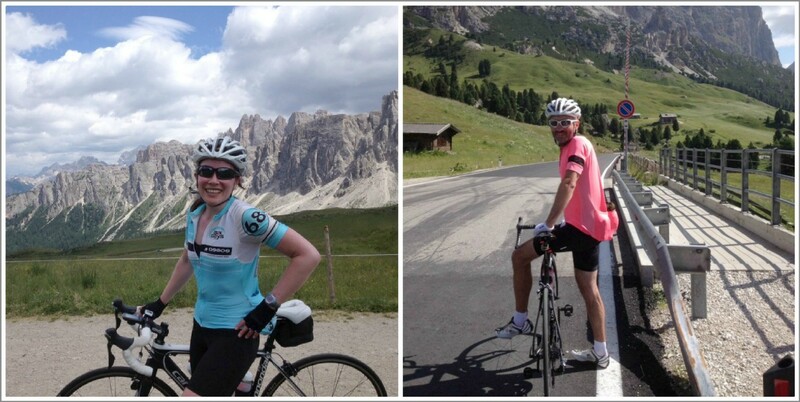 Emma Tang writes about an 80+ miles road cycling loop in the spectacular Dolomites in Italy, based on the classic sportive event the “Maratona dles Dolomites”. My partner Grant and I have visited the Dolomites several times and our first day has often coincided with the super-tough sportive the Maratona dles Dolomites. I had often pondered whether or not I would be able to get round the long-course route (138km). Although having no desire to ride it on event day (9000 participants sounds like a nightmare to me), riding the distance appealed massively! Finally, in July 2015 we took on the challenge. The official route starts in Corvara, taking on Passos Campolongo, Pordoi, Sella and Gardena, returning to Corvara, a second ascent of the Campolongo, on to Passo Giau. Then comes the long but not steep Passo Falzarego, up to Passo Valparola, and finally back to the start in Corvara. However, for our “Maratona day”, we completed the route by starting and finishing at our apartment, near the bottom of the Pordoi. We set off early, the Pordoi stunning in the early morning sunlight, a wonderful climb with over 30 switchbacks, challenging but not super steep. The morning air was cool as we descended through the trees, but we were soon climbing again into sunshine, as we took the right turn onto the Sella. This is a truly beautiful section of the route, the climb more challenging than the Pordoi, with slightly steeper gradients. Your efforts are rewarded with magnificent views of the Sassolungo. The descent to the base of the Gardena is not long, and you find yourself on the next climb before you know it. Taking the Sella Ronda in this direction means the Gardena is climbed from its easier side. The descent to Corvara follows. It is fantastic, with long switchbacks providing superb descending fun, if you like a blast downhill! The village of Colfosco is part way down, before reaching Corvara, ideal for stocking up on water or food. Buying water at the summit of any Passo tends to come with a premium! Next came the first ascent of Passo Campolongo, we would be hitting that again later as our last climb. The pass is short, only around 5km, but its backdrop is breathtaking and I found myself frequently glancing over my shoulder, to catch another glimpse. We descended into our starting village, Arabba, stopping here to buy water at the local bakery. Our theory of the altitude premium was proven, just 50 cents for 2 litres of water. 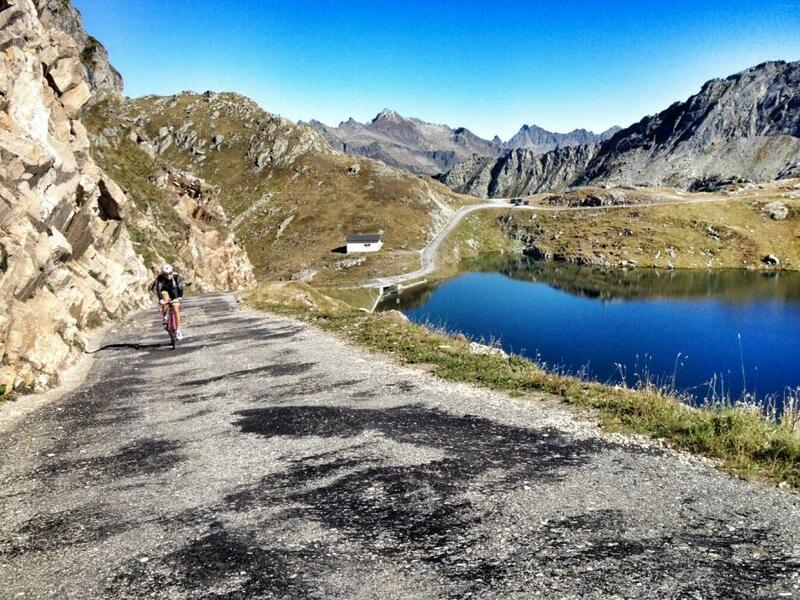 We have paid up to 5 Euros on certain Passo summits! Next comes Passo Giau, the toughest but most spectacular climb on the route, and also my favourite. A beautiful valley road where tall church spires decorate the mountainside takes you to the right turn, where you head to Selva di Cadore, the foot of the Giau. The Giau starts with a real kick, and you’ll need to have gotten your nutrition right, if not, the next 8.5km are likely to be painful! We usually stop for a hot chocolate at the rifugio, it’s deliciously thick and a good motivator to get you to the summit, but on this day we chose not to. It was going to be a long day! We admired the scenery for a short time, it would be foolish not to, with the Gusella so impressive behind the rifugio. The descent to Pocol is quite technical, with varying gradients, and some gravelly sections where road repairs had recently been carried out. Combine that with a large group of slightly insane motor bikers, you certainly have to take care on this descent. The penultimate climb is the Falzarego, from its longer but shallower side. It was fairly late afternoon by this point, and we agreed to regroup on the plateau before the rifugio at Passo Valparola’s summit. The view is a picture postcard, the panorama stretches out across the Alta Badia region. It is quite a long descent to La Villa, but the surface is good with some newly surfaced sections. Next was the slight uphill drag back to Corvara. However, we later realised that at this point we should have taken a right turn up to the Muro del Gatto, a final sting in the tail of the official Maratona route, with a leg draining 19% section! Never mind, that’s a climb we will have to save for next time! 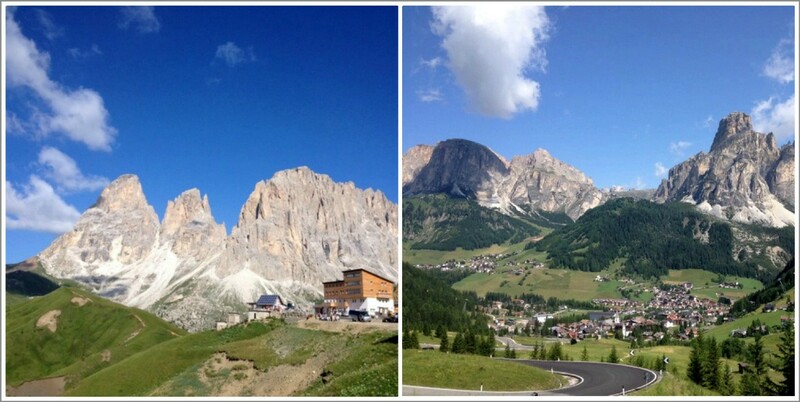 We soon reached Corvara, and I was thrilled to be feeling good, even with all those Passos in the legs. Just one more to go, the second ascent of the Campolongo, which gave us no difficulties. I’d asked Grant to take a photo of me at the summit of each Passo, as a memoir of the day. I was still smiling on Campolongo photo number 2! Just one last descent to Arabba and a short climb to bend 7 of the Pordoi to reach our apartment. I clocked 8 hours riding time, with the Garmin telling us we had ridden 84 miles and tackled over 12900 feet of climbing. A long, but fantastic day! For information on the official sportive and route go to www.maratona.it, or go to www.stillbiking.com for further writing on our cycling in the Dolomites. From the start point, take the twisting mountain roads as they climb to Passo Pordoi at 10 km. Descend to hotel Belevista, then begin more twisting climbing and descending all the way to Corvara, before taking the road back towards the initial start. However, on reaching it we now head out towards Pezzei on the SR48. Continue until the SR48 joins the SR203 at Cernadoi, taking this road if the longer extension is done, or alternatively staying on the SR48 to Pian Falzarego. If the extension is ridden, the SR 203 takes a winding road to Rucava where you take the SP251 to the junction with the SP638 near to Selva di Cadore (do not head right to the small hamlet of Selva di Cadore). Turn left on the SP638 towards Pocol, then taking the SR48 to the non extension route, joining it at Passo Falzarego. Now enjoy the ride to La Villa before finally returning to the start point once more.